Here's another picture from Pierre, South Dakota that Nick Zachariasen sent to me. 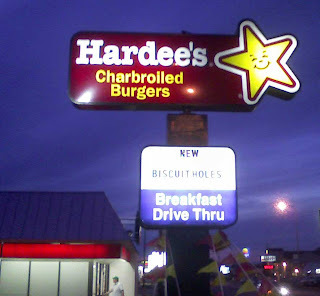 It's of a Hardee's sign advertising their new biscuit holes. I had never heard of biscuit holes before, and it just sounded too weirdly funky to ignore. What makes it extra disturbing is the "language" the holes are "speaking."